BendPak RBJ4500 rolling bridge jacks are designed to hold up to 4,500 lbs. 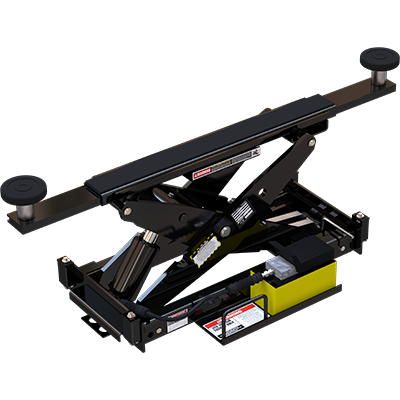 Use this rolling bridge jack with your BendPak HD-9 4-Post series car lift for increased versatility and productivity. The RBJ4500 rolling bridge jack is the DIY’ers dream product, and it’s ideal for any shop with the HD-9, arguably our most popular and versatile car lift. The HD-9 is the lift that many garages prefer because its optional caster kit allows operators to move it anywhere in their shop. Its compact size and reputation for safety mean this is one of the most popular car lifts ever made. Anyone interested in a four-post lift for wheel service should consider the HD-9 complete with a pair of RBJ4500 rolling bridge jacks. BendPak protects your vehicles by providing a non-marring rubber contact pad on the popular RBJ4500 rolling bridge jack. The durable design will hold up for many years of heavy use. We highly recommended purchasing the optional frame cradle set for use on trucks and SUVs. Once your rubber contact pads are positioned under the manufacturer-recommended lift points, you may find that high-clearance vehicles are hard to reach. The stackable adapter set comes in handy to bridge that gap and make lifting easier. Attached to the rolling bridge jack is a hydraulic power unit that also features an airline with 125 psi and 10 – 20 CFM. This independent power unit is ergonomically controlled with a foot pedal attached directly to the jack. With three lock positions to choose from, it’s easy to find the perfect height to perform wheel and brake service. For additional height, raise the car lift to its max height, add the stackable adapters and raise the rolling bridge jack as high as it will go. Now you have more access to the undercarriage than ever before.